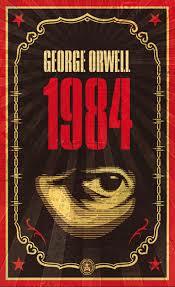 What is there to write that hasn’t already been written about George Orwell’s Nineteen Eighty-four? Like Dr. Jekyll and Mr. Hyde, the novel’s ideas proved so fundamental they have become idiomatic in the English language. ‘Big Brother’, ‘Thought Police’, ‘Orwellian’, and to some extent ‘doublethink’ and ‘2+2=5’, are expressions most are familiar with and part of everyday speech. Given the depth political and social realities are delved into in realistic, eye-opening fashion, it’s an understatement to write Nineteen Eighty-four is one of the most significant works of science fiction to have been written. Ignore the title; Nineteen Eighty-four is not an attempt at futurology. Intended as a cautionary, the book is the story of Winston Smith, an ordinary government worker living in unordinary circumstances. His job to revise history per orders from above, Smith’s life is filled to the brim with cameras, listening devices, and government snitches trying to maintain a status quo that is anything but free. The Party’s totalitarian regime—generally nicknamed ‘Big brother’ by citizenry—monitors nearly all aspects of life, including work, home, even people’s love lives. Beyond voyeuristic, Smith et al must watch their every move lest the most minor of statutes or laws be broken. The Thought Police watching and waiting, most offenders are dragged away, never to be seen again. Smith’s days filled with anxiety and dread as he trudges from work to home, meeting the enigmatic Julia one day moves life in new directions. But is Big Brother watching? Reading the author bio in Robert J. Sawyer’s 2002 Hominids, I noted the extreme lack of meaningful content. One page long, it is an endless string of: award for this, award finalist for that, considered by many this, heralded as that—even an appearance on Geraldo is lauded. But nothing spoke of the man (except the last sentence: he’s married), his style of writing, or the subjects his books approach—the usual bio fodder. This was not a surprise, however: the author bio was located at the end of the novel. I will explain what I mean by this. Hominids is a book filled with ideas having that new car smell; they’re straight from the theorist’s pen. Sawyer bets everything on the state of research of 2002, no leeway for what five or ten more years might reveal. More than half the book is “conversations” on theology, physics, biology, law, human rights, chemistry, social science, and other subjects that touch upon the cutting edge of scholarly study at the time of the book’s publishing. The problem is, 10 years have passed and already some of it feels dated. There are even old ideas (eugenics!) utilized. I can only imagine another decade will cast further doubt on the ideas discussed, the effect of the novel diminishing with each passing year. 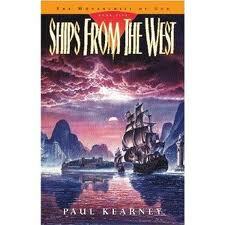 For readers perusing the volume titles of Paul Kearney’s Monarchies of God series pondering whether to slap down the cash, Ships from the West would seem a spoiler of a title for a finale. It’s not, and the further those readers get into the series, the more they realize exactly how unpredictable the story is. The pieces having long been introduced and the battles waged back and forth, Ships from the West is epic fantasy end-game near its best. Regarding timeline, Ships from the West is the most unique of the series. Picking up events sixteen years after the end of The Second Empire, it breaks the contiguity created by the first four volumes. Almost all of the main characters still yet live, but each has matured. Corfe has a daughter by Odelia named Mirren. Jemilla’s controversial child, named Bleyn, has grown up and seeks the throne. And the Sultan and Heria have likewise produced a child, a boy named Nasir. The time has also been used by Aruan and his followers, among them Himerius and Bardolin, to build a mighty army at Charibon, their blades pointed directly at Torrunn. King Abeyleyn has also been busy. With the help of Hawkwood, he has constructed the mightiest fleet the world has ever seen, and at the opening of the book, the flotilla aims its prows toward the Western continent in an effort to wipe out the evils discovered there. From the mighty battle killing numerous important characters in the first one hundred pages to the conflicts that follow, Ships from the West is virtually non-stop action. With Hawkwood, Bardolin, and Murad arriving back on Normandian shores in the epilogue of The Iron Wars, Kearney hinted the next book is ready to shift back into a continent-scope story. 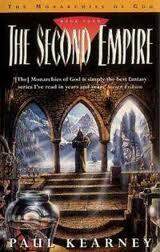 Like Hawkwood’s Voyage and The Heretic Kings, The Second Empire does precisely that. With Abrusio still uncertain over the state of their king, the Merduks preparing for a final assault, matters in the West still unexplained, and Corfe’s newfound role anything but trusted by the nobility he usurped, the series is back in full swing. The Second Empire opens by going back in time to explain exactly how the trio of voyagers were able to get their way back to Hebrian shores—a tale that Gondolfin, Abeleyn, and Isolda scarcely believe as Abrusio starts to rebuild itself from the tatters of civil war. Corfe, now general of the Torunnian armies, continues to face opposition from not only the Merduks, but also his own countrymen, in particular a nobility who hate to see non-blue blood take power. And though the Sultan himself is softening with his Torunnian wife Heria, he continues to push military matters, commanding a direct and final assault be laid upon the capital, Torunn. Events in the interior continue to develop as word reaches the provinces that Charibon is starting to prepare an army of its own. And through it all, the mysterious Aruan, the shape-shifting mage, continues to ply for influence and collaboration from those he considers able—taking and giving as he sees fit. 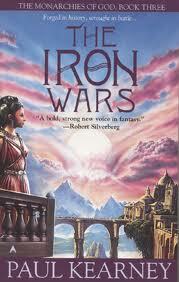 The Iron Wars is unique among the five volumes of Paul Kearney’s Monarchies of God series. Like the handle of a dumbbell, it connects the two fat ends of the story. Focusing on a single area, the book is almost entirely centered on the eastern province of Torunna, Corfe’s point of view driving the novel from beginning to end. With the Merduks gathering for a major sortie into Torunna, matters in the province are on edge, a fact not helped by the single-minded antics of King Lofantyr and his desire to maintain the appearance of power. Taking matters into her own hands, Odelia continues sponsoring Corfe and his ragtag army as they handle skirmishes with not only Merduk raiding parties, but also the king’s attempts to prevent his mother from damaging his reputation, and as a result, ego. Tension inside the kingdom as strong as the threat they face from outside, the fate of Torunna, one of the last bastions of power in Normandia, is far from certain. 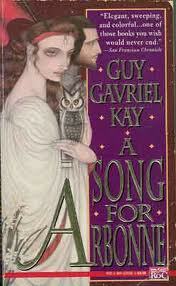 Following on the heels of the success of his 1990 Tigana, Guy Gavriel Kay’s 1992 A Song for Arbonne finds the author moving in a slightly new direction. Toning down the magic but upping the ante from a soft-fantasy/romance point of view, the novel is almost a paean to the virtues of femininity. Set in a fantasy version of medieval France and focusing on the Court of Love, music is once again an art form at play. No wizards or powerful displays of magic, this time around court politics which value musical composition and performance are set against the lascivious and aggressive dogma of the neighboring country, Gorhaut. Style uneven, the remainder is a typical Kay story, heroism, religious conflict, honor, and loyalty carrying the day. A Song for Arbonne features a variety of characters and points of view. The main character is Blaise, a mercenary warrior from Gorhaut who now makes his home in Arbonne working for the nobility. An outcast, Blaise’s father is the religious leader of the Gorhauts, a country firmly ensconced in the male-centric beliefs of the deity Corrascon. Arbonne a follower of the female god Rian, a religious/cultural knife threatens to cut Blaise in two as he balances his heritage with the ambitions of the queens and dukes, troubadours and ladies of Arbonne he has sworn to protect. Assassination attempts, court intrigue, and moments of destiny beyond his control, it is not long before war threatens the land and Blaise must declare his allegiance. There are four “novels” in the Chinese canon that are considered the greatest of all time. 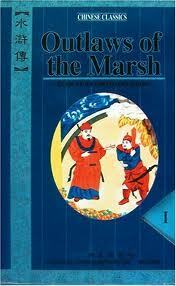 Even the devastating Cultural Revolution of the 1970s unable to shake cultural perception of their importance, Shi Naian and Luo Guanzhong’s 14th century(ish) Outlaws of the Marsh, or as it is known in other translations, The Water Margin, Men of the Marshes, or The Marshes of Mt. Liang, is one of the four. Though technically a work of historical fantasy given the parallels to factual Song dynasty events and “super-hero” powers many of the outlaws possess, the book is better classified as a work of social commentary given the political and social context, not to mention denouement. Considered a juxtaposition to another of the canonical works, Chinese people say: “The Three Kingdoms should not be read by the old, and Outlaws of the Marsh should not be read by the young.” It took me years of thought to realize why, but I finally did. Spanning more than 2,500 pages (yes, 2,500), Outlaws of the Marsh is the story of Song Jiang and the rise and fall of the band he unites to fight against a corrupt government. Bearing some similarity to the legend of Robin Hood, the first half of Outlaws relates how 108 men come together, fighting off government troops who seek to infiltrate and destroy their mountain-marsh stronghold. Each of the men having his own history and entry point into the group, Shi goes into varying levels of detail describing the motley collection and the fantastic skill each possesses. Dai Zong for example, is able to run nine times faster than the average man, Wu Song is strong enough to kill a tiger with his bare hands, and perhaps the most enjoyable Li Kui, the human Tasmanian Devil, flies in to a rage at the slightest provocation, but always remains loyal to the cause. William Gibson’s Mona Lisa Overdrive, the concluding volume to his influential Sprawl series, saw several of the main characters living within an aleph. The idea borrowed from Jorge Luis Borges, an aleph is an object that contains a virtually infinite amount of knowledge. Operating as a permanent virtual reality, the surface of the idea was only touched upon by Gibson, begging another writer to fully detail the idea. Greg Egan’s 1994 Permutation City does just that. 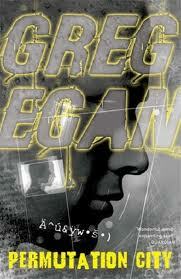 The world of 2050 Egan imagines is not so far removed from our own, and like Gibson’s, is scarily plausible. Technology advanced to the point personalities are uploadable, the rich are able to afford the computing power necessary to maintain a virtual copy of themselves in VR while the less well-to-do save in the hopes of having immortality upon death—or at least until their finances dissipate. The technology capable but not ubiquitous, it requires huge quantities of computing power to keep the system running, making competition for technical resources fierce. Public services (not unlike the “cloud” service companies are currently driving at) are rented and used as needed, home networks prohibitively expensive to operate. John Laurence, a young television reporter for CBS news, was sent to the front to cover the Vietnam War in 1965. Though barely surviving some situations, Laurence would go on to serve two additional “tours of duty”. 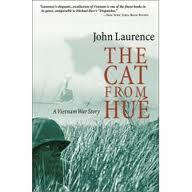 It is this experience, along with personal reflection and commentary on the social and political arenas of Vietnam and the US that would later be collected in The Cat from Hue. Interesting reading, those wishing to look deeper into life on the front lines in America’s war in Vietnam and media in the US should have a read. A devil-may-care attitude is not precisely the mindset with which Laurence arrived in the southeast Asian country at war. It’s fair to say, however, his relative youth played a hand in repressing his fears and being somewhat innocent regarding American political interests in the region. The more time he spends at the front, however, interacting with soldiers and dealing with the contradictions and propaganda produced by not only the government but his own news agency, slowly drives Laurence to take his opinion of the war in the direction of much of America’s counter-culture, though naturally with a higher degree of sympathy for the soldiers and veterans and the clashing expectation from each side. Having one of the earliest recorded in the world, China’s history becomes even more interesting when one learns it is unbroken. From the 3,600 years ago to modern day, scholars and historians have kept record of the Middle Kingdom’s events—amazing considering the multiple fragmentations and government transitions. 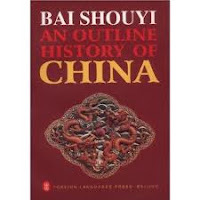 When China’s Foreign Language Press decided to publish this history in 1982, they called upon Bai Shouyi, a man with impeccable credentials, to condense 5,000 years into a book. The 800 page An Outline History of China is the result. Often when a person needs something, it’s best to go to the source. Such as it is with An Outline History of China. Bai being Chinese and having complete access to historical archives, the book is flooded with data and information coming directly from actual records and the work of thousands of years of Chinese historians. 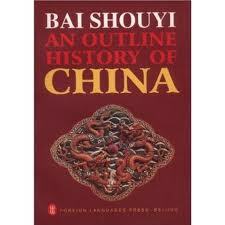 Of particular interest is the early history of China. Dynasties numerous and important figures even more so, I will not even begin to relate a summary of this, but suffice to say Bai’s work can be considered the authoritative version of matters in China before the 2nd millennium. In this regard, the book is invaluable. For those who are unfamiliar with Australian geography, take a look at any topographical map of the continent. Roughly 70% is covered in dry land, most of which is arid desert seeing little to no rain throughout the year. Inhospitable to say the least, this knowledge was known only to the Aborigines when Europeans began settling the land more than 300 years ago. White man’s ambitions being what they are, the desert was seen as something to be conquered and an obstacle to be "discovered" as more and more foreigners began settling the land. In following, numerous parties set out with differing goals in mind, some to find mythical places, others to be the first to cross continent, or be the first to plant a flag at the center. Not all the expeditions successful, Tim Flannery’s The Explorers: Stories of Discovery and Adventure from the Australian Frontier collects the “best of” of journal entries from those who braved the endless desert—only the words living on to tell of the experience for some. 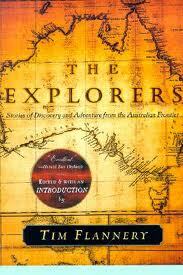 Most if not all of the explorers and expeditions Flannery includes will be known to Australians. They include the Sturt expedition (he brought a boat thinking to find a huge lake in the center), Ernest Giles (who wisely turned around after getting lost a few times), and the famous Burkes and Wills’ (from which only the journals survived of the expedition leaders). Each having its own angle on Australia’s interior, the landscape and its harsh realities come to life as each viewpoint adds itself to the previous. 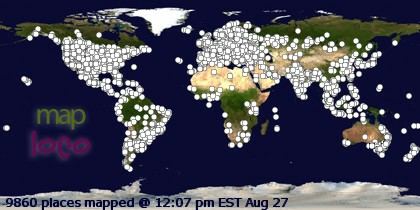 Hot, dry, and endless are only the beginning. The name Rick Ridegway will not be known to many. Amongst mountain climbers and environmental enthusiasts, however, it is. Part of the first American team to climb K2, he has gone on to be one of television’s leading producers of environmental documentaries and the author of several books, all generally focused on mountaineering. Despite having an interesting personal history, his 1998 Below Another Sky: A Mountain Adventure in Search of a Lost Father has other aims: to kindle an appreciation of mountain wildernesses in a daughter who lost a father climbing. In the early 80s, Ridgeway was climbing with a group of friends, among them Jonathan Wright. Descending, they decided to have a little fun by sliding down a snowfall. Something they’d done often, an avalanche nevertheless ensued, and Wright died in Ridgeway’s arms minutes later. Asia, Wright’s daughter, was just a baby when the incident occurred. 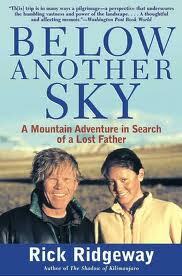 At the age of 20, however, she desired to see her father’s beloved mountains and the place he died. Asking Ridgeway to be her guide, Below Another Sky is that journey. One hundred and fifty years after the turn of time’s hourglass, BC to AD, the Chinese were in the midst of a major dynasty change. A time called the “Three Kingdoms”, the period was later epitomized as the perfect example of how dynasties vacillate between unity, fragmentation, and unity once again. Centuries later the history was published, including a romanticized version of events called simply The Three Kingdoms. Japan experiencing its own transition of dynasties at the end of the 12th century, The Tale of the Heike is the country’s analogous work of literature. Its is no less powerful. 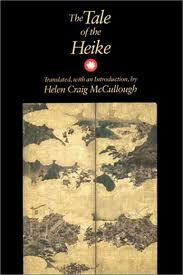 The Tale of the Heike is the story of the transition of power from the Taira to the Minamoto clan. The groundswell beginning several years before the Genjei War which decided matters, the book opens with a slip in the Taira’s power base many decades prior. Taking years for this slip to manifest itself as a major weakness, the surrounding events are described and woven into the full political context of the kingdom at that time. Phase by phase, individual maneuver by maneuver, the machinations and plots of the Minamoto clan slowly reveal themselves. And in telling of the rise to power, not only cabals and battles fill the pages. Earthquakes, assassinations, mass executions, and major fires—all from real history—flesh out the change of dynasty, giving the history an edged interest. The human mind, and those random people it incites to attempt the most difficult journeys, is one of the most amazing aspects of life. Climbing the world’s highest mountains, surfing the biggest waves, trekking to the poles, and numerous other determination-requisite quests make humanity what it is, as much as war and disease. Robyn Davidson possesses a brain with such ambition, and her 1980 Tracks is the open, inspirational record. An Australian and lover of her country’s desert lands, in the late 1970s Davidson set out to the interior of Australia with $6 in her pocket and the desire to work with camels such that she might fulfill her dream of travelling from Alice Springs to the Indian Ocean by camel. Two years later a handler of the eccentric humped back animals, she was still unable to meet the financial requirements of outfitting a solo expedition. But after applying for support from National Geographic, Davidson was on her way, four camels and a trusty dog at her side. There are innumerable collections of Chinese poetry. Some are collected by poet, e.g. Li Bai, Du Fu, Su Shi, Tao Yuanming, and the other greats. There are some by dynasty, the Tang and the Song generally considered the best, though the Yuan and Ming also make a good showing. And there are collections by theme, hermitry, friendship, transcendence, Daoism, etc. 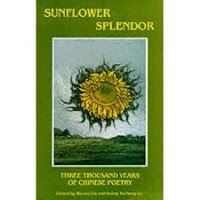 Sunflower Splendor has a lot of all, making the anthology amongst the best yet published, and will be of particular interest to people who have read a fair amount of Chinese poetry already and are looking for atypical material from the Middle Kingdom. Sunflower Splendor undoubtedly the work of many years, editors Liu Wuqi and Irving Yucheng Lo and the book’s roughly fifty contributors have collected among the best of what Chinese poetry has to offer. From the early dynasties to the latter, the themes of water to parting, to a huge variety of poets, well-known to obscure, every facet of Chinese poetry seems packed in this collection. But at 681 pages, it should come as no surprise. 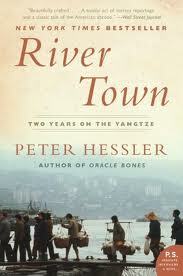 Having lived in China for four years, I can personally vouch for Peter Hessler’s memoirs in River Town: Two Years on the Yangtze. It’s a spot on read that would be a great introduction for anyone looking to move to the country, particularly the “countryside”, or for anyone just curious about everyday life in the Middle Kingdom. Though much of the China Hessler describes is fast changing as globalization takes its toll, the cultural attitudes exhibited by the people he and his fellow teacher, Adam Meir, came in contact with, pervade. Hessler joined the Peace Corp in 1996 and went to live in the “small” city of Fuling on the Yangtze River in central China. He, together with Meier (who features prominently in the book), went to work as English teachers at a local university. The institution attended mostly with students from local villages, the city itself has nothing of the more civilized infrastructure of Shanghai or Beijing. For the next two years, Hessler spent his time not only teaching, but traveling in the surrounding areas, observing life and talking with the locals, his language skills developing by the day. Almost twenty years have passed since the Balkan wars. Talking with Croatians, however, one is hard-pressed to realize the time lapse. Bullet holes and signs warning of undetonated munitions appear here and there, but by and large the people and country are relaxed, a timelessness lightly permeating the sun-baked atmosphere. There is little that is exotic about Croatia—no world wonders or places of natural beauty that make the jaw drop. I will admit I went there expecting something of the like, maybe some spectacular Roman ruins or a secret waterfall that few know of. But I learned Croatia is about the enjoyment of the simpler things in life. I cannot speak for Zagreb, but the beaches, the sea, the restaurants, the small towns and villages, and markets we saw were all on a small scale. Little is hurried and even less is worried over. The people were generally light hearted, and though not rolling out the red carpet for tourists, didn’t seem to mind the influx of people in the summer. The following are some of my photos from my time there. Having only a little more than a week of holiday, we opted to drive straight through the night, Poland to Croatia, to economize time, the whole trip taking 12 hours. Everything went ok until we hit got within an hour of our destination. There had been a terrible bus accident that blocked the entire highway, which meant sitting for six hours in the longest line of traffic I’ve ever been part of. Eventually the police herded us onto another, much smaller road, where the line continued. Half asleep, we decided a side road may get us to our destination quicker. Not only did we arrive sooner, the road also provided us some spectacular views of the Dinaric Alps. Like drugs for techno-action junkies, Richard Morgan did the futuristic, world-weary warrior story well in his Takeshi Kovacs series. A wild west style of justice continually seeping through the scenes of blood and gore, he also indicated there may be a little more on his mind than just action. 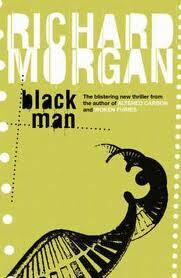 The nihilism left without an explicit voice, Morgan set out to rectify this in his 2007 Black Man (Thirteen in the US). Slowing plot to allow ideological exposition a place, the novel finds the author highlighting the prevalence of vice in unabashed, overt style. Thematic content not always matching character representation and premise, the result is a story with conflicting agendas. Black Man is the story of Carl Marsalis, a genetically modified British super-soldier working for the UN’s GLA (like the CIA). Using his experience as a special forces operative, he travels the world apprehending criminals, usually rogue thirteens, of which he is one. Called “hyper-males”, thirteens are fueled by testosterone doses, have been upgraded physically, trained to violence, can be easily goaded, and yet retain a sense of logic to help them plan their moves—Conans with guns. Marsalis himself a thirteen but on the right side of the law, his skills prove invaluable toward catching those of his kind who disrupt society. After what might be understated as active output in the 1950s, Isaac Asimov took a bit of a breather, waiting more than a decade to publish his next novel, The Gods Themselves. 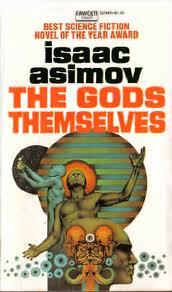 Serialized in 1972, it sees Asimov taking his criticisms to heart (e.g. no aliens, no women, scientists as altruistic gods, etc.) and challenging himself to write a story which defied his storytelling to date, as well as experimenting with format. That he dedicates the book to “mankind” only heightens the ambition. Though revealing a certain timidity working outside his zone of comfort, Asimov’s effort is admirable, the novel he produced deserving of the genre categorization if ever there were one.